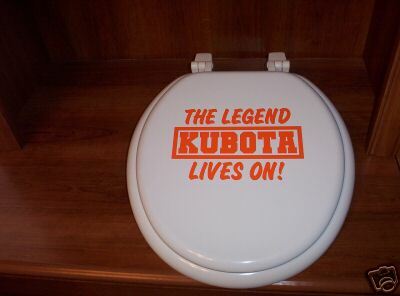 While crusing eBay today looking for all sorts of Kubota-related goodies, we came across this Kubota-branded toilet seat. Although it does not look to be an officially licensed Kubota toilet seat, perhaps the higher ups in Kubota will take notice and release their own, official, toilet seats. Expect models available in glide shift and hydrostatic versions this fall, with attachments such as toilet paper dispenser and magazine rack as optional upgrades. Financing plans available from KCC. Perhaps this will inspire Kubota engineers to develop their own toilet seat in repsonse to growing consumer demand for restroom hardware. See original eBay auction here.